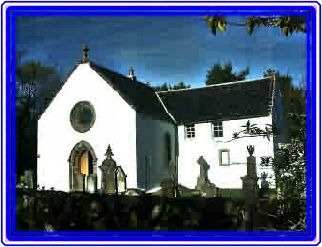 The Friends of Kilfinan Parish Church is an association of those dedicated to preserve, maintain, repair and restore the fabric of this important building. Although primarily a fund raising venture the association hopes to organise a number of social and educational events. See News for details of future events. Is a much altered medieval church, in a church yard which on the South and West falls steeply towards two small tributaries of the Kilfinan Burn. The 13th century church of St Finan in Cowal is first recorded between 1231 and 1241 in a series of grants and confirmations by Duncan son of Ferchar, and his nephew Laumon, ancestor of the Lamonts, who gave the church and all its rights, to the Cluniac Monks of Paisley. S/CL and the date 1633 are carved in the East and West cavetto skewputts of the crowstepped North gable. The same date and initials are carved in relief within a cusped frame on the lintel of the West doorway with D/BS for Sir Coll’s wife Dame Barbara Semple. The vault itself incorporates late medieval work. 1759 The Bird Cage Belfry, at the West end of the church, was added while the church was undergoing extensive repairs. The bell bears the date 1832. 1881-82 The church owes its present appearance to a restoration by John Honeyman, a Glasgow architect, who submitted a scheme which included a new roof and stone skews, rearranged seating with a new pulpit and benches and two new North windows. He closed the North Lamont Aisle and the West end gallery, shared by Ardmarnock and Acharossan estates. 2000 With the financial help of Historic Scotland and many others restoration work on the exterior of the Church and Lamont Vault started that summer. During the restoration work evidence of a medieval doorway was found where the middle window on the south side is at present. A door lintel was also exposed on the North West corner of the main body of the Church. In the Lamont Vault two small windows were uncovered dating from medieval times. One was behind the exterior stone steps leading up to the Lamont Aisle the other was on the east wall. 2003/4 Work on the interior of the church uncovered the infill of the Lamont Vault in 1633 and its sandstone pillars, a Georgian window arch. There were wall markings of the old 17th century pulpit by the then south door. A large amount of medieval bones were also uncovered under the floor boards, but no complete skeleton. They had been removed from the east of the Church Yard to make way for the present road in 1750-1759 while the church was being extensively rebuilt. 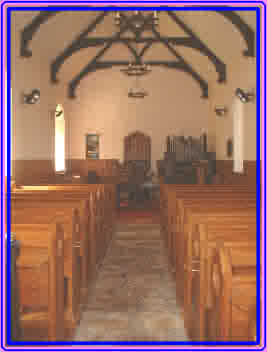 All materials used comply with the 1881 building regulations and the pews were stripped back to the natural wood. The wood panelling behind the organ on the North West corner, is also original from 1881.